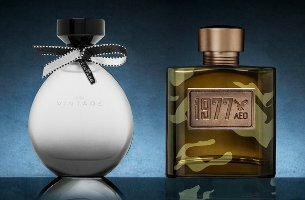 American Eagle has launched two new fragrances, AEO Vintage for women and AEO 1977 for men. AEO Vintage ~ "A bright, playful scent that's heritage inspired & made to remember." With mandarin, apple, mango, white flowers, lotus, rose, praline, musk and blonde woods. In 50 ml "Fragrance" or rollerball. AEO 1977 ~ "Heritage inspired, down to earth and packed with spontaneous charm." With dewy greens, ozone, bergamot, cedarleaf, clary sage, basil, precious woods, patchouli and warm musk. In 50 ml "Fragrance" or 127 g Body Spray. Because nothing says “vintage” like mango, praline, and lotus.